Jessica Sommerville is the owner of Tender Moments Childcare. Ms. Sommerville is a former preschool teacher and a mother to five children. At Tender Moments Childcare, children are encouraged to play outside and get dirty! The children in her care also participate in sensory play and art. Ms. Sommerville places a high emphasis on healthy eating habits along with exercise. Ms. Sommerville knows the struggles that many breastfeeding mothers can encounter when using childcare and wants to provide them with support. She says that she will “Use the breastfeeding-friendly resources and practices to better care for babies”. Ms. Sommerville recommends the free Breastfeeding-Friendly San Diego training to other providers as it is a great resource to help promote breastfeeding. 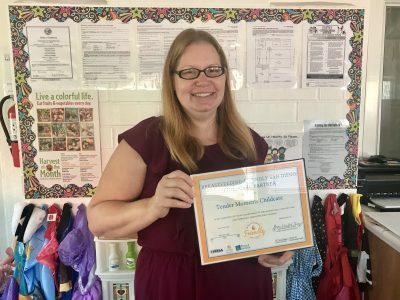 Congratulations Tender Moments Childcare and Jessica Sommerville on becoming a recognized Breastfeeding-Friendly San Diego partner! Previous Article: City of Hope International Church is Planting a Garden!